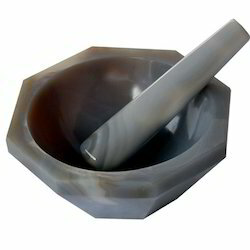 Offering you a complete choice of products which include agate mortar and pestle (gray). We are one of the most revered manufacturer, exporter and supplier of an impeccable assortment of Agate Mortar and Pestle-2"/4"/6"/8". Our provided product is tested on several parameters so as to make certain its defect free range. This product is precisely developed by using premium quality components and sophisticated technology in adherence with the set standards of industry. Customers can avail this product from us at competitive price.